Since 1901, Blue Book Services has been the leading provider of credit and marketing information for the fresh fruit and vegetable industry. We serve suppliers, buyers, brokers and transporters by providing current financial and marketing data for produce companies across the world. 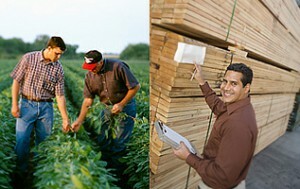 We bring the same experience to the lumber and forest products industries. Our specialists are constantly working to update credit ratings and business records. Instead of looking to opinion or speculation, we base our rating information on a company’s trading history and current financial standings. Customers have trusted us for years to get a true insider’s look into how their business decisions are affected by organizational relationships across the industry. With our use of cutting-edge technology, facts instead of opinion, and overall reliability, every business in both the produce and forest products industries could benefit from joining Blue Book Services.